An introduction to modern physics and to Richard Feynman at his witty and enthusiastic best, discussing gravitation, irreversibility, symmetry, and the nature of scientific discovery. Richard Feynman was one of the most famous and important physicists of the second half of the twentieth century. Awarded the Nobel Prize for Physics in 1965, celebrated for his spirited and engaging lectures, and briefly a star on the evening news for his presence on the commission investigating the explosion of the space shuttle Challenger, Feynman is best known for his contributions to the field of quantum electrodynamics. 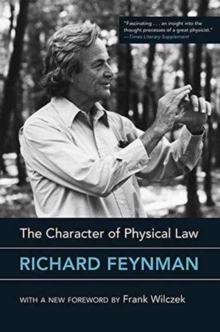 The Character of Physical Law, drawn from Feynman's famous 1964 series of Messenger Lectures at Cornell, offers an introduction to modern physics--and to Feynman at his witty and enthusiastic best. In this classic book (originally published in 1967), Feynman offers an overview of selected physical laws and gathers their common features, arguing that the importance of a physical law is not "how clever we are to have found it out" but "how clever nature is to pay attention to it." He discusses such topics as the interaction of mathematics and physics, the principle of conservation, the puzzle of symmetry, and the process of scientific discovery. A foreword by 2004 Physics Nobel laureate Frank Wilczek updates some of Feynman's observations--noting, however, "the need for these particular updates enhances rather than detracts from the book." In The Character of Physical Law, Feynman chose to grapple with issues at the forefront of physics that seemed unresolved, important, and approachable.